Reason for Reading: I’ve read a handful of Dickens’s novels, but I read them sheerly for enjoyment, without concern for his influence on the world of writing; and I knew next-to-nothing about him as a person. The Penguin Lives series is nice for brief and somewhat general knowledge about people you’re interested in, but not interested enough that you would want to wade through 700 pages of detail aimed at die-hard fans. Synopsis: This book is a look at the life of Charles Dickens, largely in relation to the novels he wrote. Along with connecting his plots to his life, Smiley offers criticisms of Dickens’s novels (her own as well as those of other reviewers). 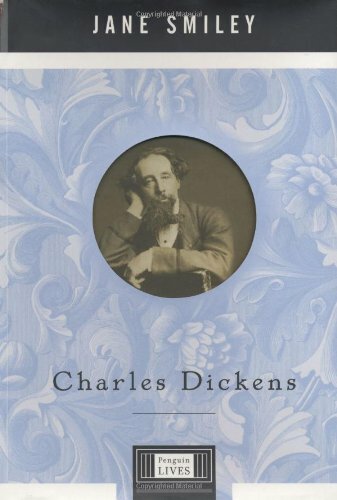 Why you should read this book: Prepare to be astounded by Dickens’ amazing output and the energy he displayed throughout his entire life. Simply looking at the number of huge novels he wrote seems impressive enough, but throw in a fondness for acting, frequent 20-mile walks, almost a dozen children, editing, and traveling (amongst other things), and Dickens seems to be nothing short of a miracle-man. Wow. While Smiley obviously has a lot of respect for Dickens, she displays fairness in depicting his life and novels, also pointing out his critics’ views and defending his wife (who bore him eleven children) from Dickens’ scorn of her lack of energy and enthusiasm for everything he did. Another fun aspect to reading biographies is finding unexpected connections, such as Dickens’ daughter marrying fellow author Wilkie Collins’s brother. Why you should avoid this book: Charles Dickens is heavy on the literary criticism in comparison to details about Dickens’ actual life. By all accounts, he was a private man, but there’s a lot of pages dedicated to pondering how much of his fiction is taken from his own life rather than presenting known facts, and since so much has been written about Dickens and his works, there’s plenty of other books if you’d rather focus on one aspect more than the other. Smiley’s writing style might be a bit academic for some tastes. But even so, Dickens’s more signal quality, the one most often commented upon by his acquaintances and the one he relied upon at all times, was his energy. It was in this period that he took up the habit of long, vigorous daily walks that seem almost unimaginable today for an otherwise very busy man with many obligations. At a pace of twelve to fifteen minutes per mile, he regularly covered twenty and sometimes thirty miles. Returning, as his brother-in-law said, ‘he looked the personification of energy, which seemed to ooze from every pore as some hidden reservoir….’ His energy contended with discouragement, fear, discontent, and illness – he had been frequently ill as a child, and recurrent bouts of a painful kidney ailment, as well as some sort of facial neuralgia, nervous exhaustion, and various infectious diseases, continued to plague him. He veered between overflowing vitality and prostration in a manner that seems to the modern sensibility almost hysterical. In addition, Pip is constantly beset by doubts about his own intentions and nature. Whereas David knows the injustices of the world for what they are, Pip has a strong sense of guilt, which renders his response to obvious injustices more ambivalent. He holds himself accountable (and Dickens seems to agree with him) for ignorance that to the reader he certainly cannot help. Also recommended: The Autobiography of Alice B Toklas by Gertrude Stein; Great Expectations by Charles Dickens; The Master by Colm TÃ³ibÃ­n; Oliver Twist by Charles Dickens. Also by this author: Ten Days in the Hills; Thirteen Ways of Looking at the Novel; Age of Grief; The All True Travels & Adventures of Lidie Newton; Barn Blind; Duplicate Keys; A Year at the Races; Greenlanders; Horse Heaven; Moo; Ordinary Love and Good Will; Thousand Acres.